A few years ago, there was a time when we just had to remember our favorite channel number on the television and start watching our favorite shows. The times have changed nowadays and so are our content watching habits. Now the TV is considered an idiot box due to the rise of some good online streaming websites. Due to an increase in such websites, we have to keep choosing from the websites that offer the best content and are the same at the same time. Some websites like coke and popcorn were doing well lately but they are no more available on the internet. Hence, many of the movie buffs are looking alternatives for coke and popcorn. As always, we are always there to help you out to find the best online content and so we are here today with the Best Coke and Popcorn Alternatives. So read on to know more. Though the names sound the same as popcorn, this one is a different site called popcorn flix. It is popular among users for the movies and TV series, which are available for free on popcorn flix. This service has apps on Android and iOS platforms and does not offer an option for premium subscription. Hence, it is always free and ad-supported. Its service is currently available in the United States and Canada. Its collection ranges from Western, free, Sci-fi, documentaries to stand-up comedy, action, and drama. It also has a large collection of TV shows and is supported by Apple TV, Roku, Amazon, Xbox, iOS and Android platforms. 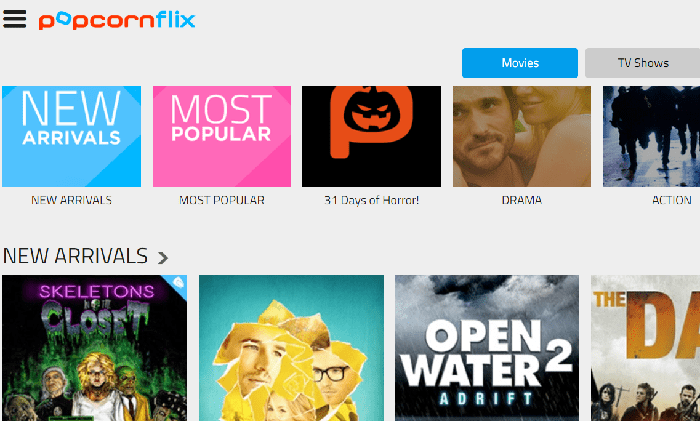 Popcorn Flix is one of the best coke and popcorn alternatives to watching movies online. Yidio is basically a free movie streaming platform but also offers some paid content as it accumulates content from Amazon, Netflix, and iTunes. You should definitely go for yidio if you are looking for similar websites like coke and popcorn. It offers genres such as Romance, Classics, Horror, Animation, Documentary, Science Fiction, Fantasy, Comedy, Cult Movies, Western, Action, Adventure, and Drama. It will redirect you to other streaming sites such as popcorn flix for the content that is not available on Yidio. It also offers TV shows from channels like Syfy, ABC Family, Nickelodeon, NBC, Disney, Comedy Central, Lifetime, USA, A&E, HBO, AMC, TLC, or History Channel. 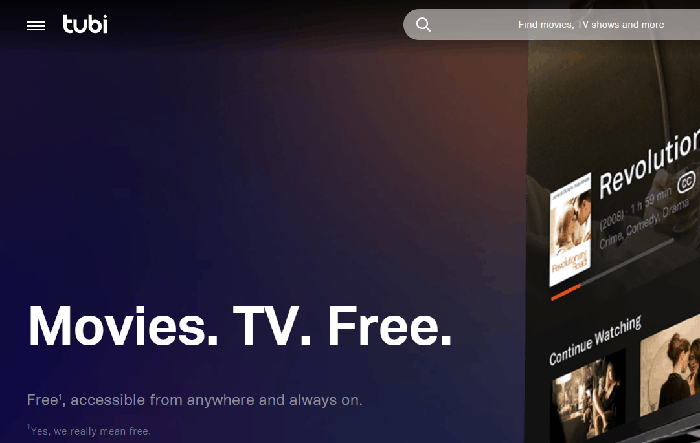 Tubi TV is a great online platform that offers movies for free. It is one of the best alternatives to popcorn and coke. It offers content in various genres such as Action, Drama, Comedy, etc. and has a collection of more than 40000 shows and movies. Tubi TV is the largest free library of free media content online. AdRise announced a licensing agreement with Paramount Pictures for the rights to 50 films per month on Tubi TV in 2015. Tubi TV’s library grew to over 40,000 film and TV episodes after investments and content partnership with MGM Studios and Lionsgate. The library has now crossed more than 50000 titles, which is just next to the collection of Netflix. It is available in the United States, Canada, and Belgium. We all know that Netflix is one of the best online streaming service available online today. There will be hardly any people who don’t know or have not tried Netflix. It offers awesome content and shows but it is a subscription-based service. However, you can still use some tricks to watch Netflix for free and it even offers you 1 month free trial for a well-informed purchase decision. Netflix is available on almost all smart devices. 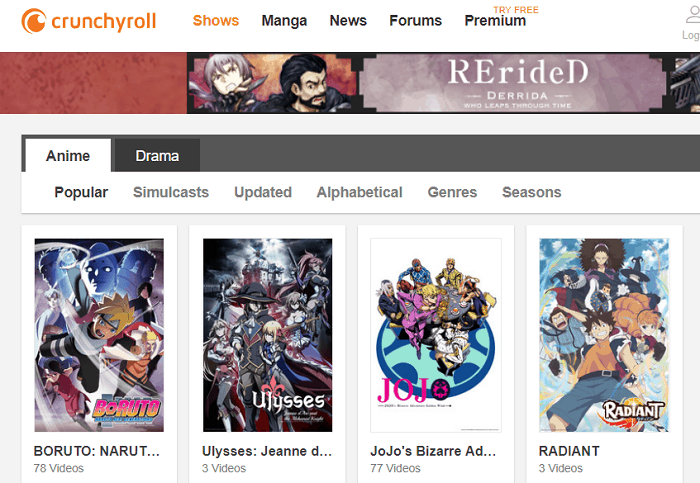 Crunchyroll offers 14 days of a free trial for its new users and after that, it offers both free and paid versions. The free version offers limited content along with ads and videos at standard definition quality only whereas the paid subscription offers ample unlimited content without ads and allows high definition 1080p streaming. It will cost you around $ 6.95 /month. There is one more offering called premium+ membership that it offers which costs around $ 11.95/month. Besides that, it also offers premium email support with priority responses. It also lets users view content on their apple and android smartphones through their app. The devices that it supports consist of Wii U, Xbox One, Xbox 360, Chromecast, PlayStation 3 and 4, Apple iOS, PlayStation Vita, Windows Phone, Android, Roku box and Apple TV. You can also add Crunchyroll in the list of Coke and Popcorn Alternatives. Crackle is a free Sony-owned platform and is often referred to as Sony’s Netflix as it offers a wide variety of content. It is an ad-supported platform which offers free content from a range of TV shows like community and Seinfeld, and popular movies like super bad and 50 first dates. It also offers originals such as Super Mansion. Several anime shows from Funimation are also streamed on Crackle. This platform is supported by Amazon Fire TV, Apple TV, Chromecast, Roku, Android and iOS as well as LG, Samsung, Sony, Vizio smart TVs. It is running from more than a decade now and giving tough time to competitors. Viewster is another free top streaming site which is a very good alternative to popcorn and coke. It is available in 120 countries worldwide and is completely legal. Viewster offers content based on your regions and hence it offers different content in different countries. There is a huge content available for the users of USA so if you want to view US content, then you might want to trick the site into showing you that by using a VPN. When it comes to Coke and Popcorn Alternatives, then The Hulu also makes the place. Hulu was a very good streaming service that was free and ad-supported. It is now merged with Yahoo view and became subscription based service. Yahoo and Hulu joined hands to offer anime, Korean TV series, and content from various TV networks. It is currently available in the United States and Canada but you can always view the content using VPN. Most of the content is available for free but you will have to pay a small amount to unlock certain categories. Thanks for reading the article friends. We have introduced you to the Best Coke and Popcorn Alternatives, and we hope that this article will help you and not let you miss popcorn and coke. Stay tuned for more such articles and share this article with your friends to help them as well. Some websites like coke and popcorn were doing well lately but they are no more available on the internet. Hence, many of the movie buffs are looking alternatives for coke and popcorn. As always, we are always there to help you out to find the best online content and so we are here today with the Best Coke and Popcorn Alternatives.